Surveying the events of the last ten days, it seems to me that the need of the hour is to penetrate the fog of misinformation and fantasy with regard to the consequences of the Geneva Resolution on Sri Lanka, and to make a realistic appraisal of the situation. The point of departure is a clear understanding of the facts. 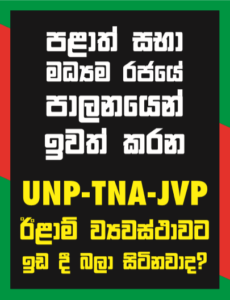 I would like to set out here eight very compelling reasons why the Government’s action in this regard is, without a shadow of doubt, gravely detrimental to the national interest of Sri Lanka, and why implementation of this Resolution should be resisted with all vigour. “Just as in Kosovo if enough civilians died in Sri Lanka the world would be forced to step in” – Pulidevan of LTTE to a pal in Europe (quoted in Harrison 2012: 63). Guided by a series of studies that I have indulged in over the years 2010-15, let me summarize my findings in point form. The focus is on the period 2008-to-May 2009. However, four facets of the broad historical context must be stressed initially: (I) Prabhākaran had one goal only: Eelam and a separate state; (II) the LTTE used two ceasefire periods in 1995 and 2001-06 as recuperating periods for renewal of their war effort; (III) as Ben Bavinck and the UTHR reports have insisted Thamilīlamunder the Prabhākaran was a fascist state; and (IV) the Rajapaksa government which struggled for survival against the LTTE proved the validity of the Marxist dictum that there is an unity in any contradiction: it became distinctly authoritarian itself, albeit still populist in its self-convictions.